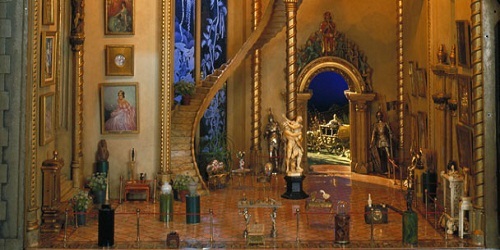 Moore’s dollhouse has been featured at the Museum of Science and Industry in Chicago, Illinois since the 1950s. During these 60 years the house has been seen by millions of people. 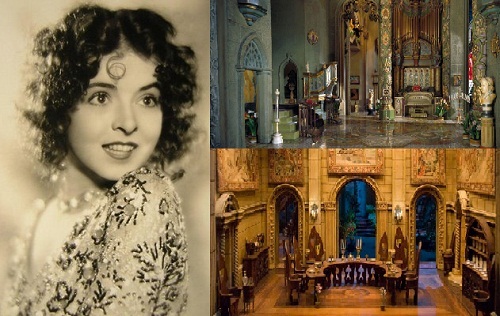 In 1935 Colleen Moore transformed her Fairy Castle into a passion for helping children, it was a time of the Great Depression. She organized national tours to raise money for children’s charities. 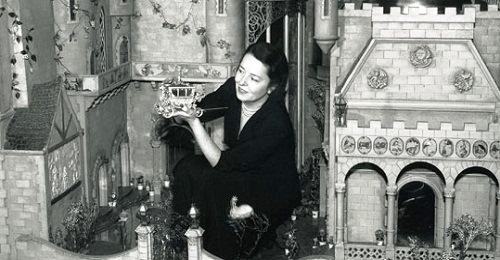 In 1949 Major Lenox Lohr, director of the Museum of Science and Industry, convinced Colleen Moore to have the Fairy Castle make one final journey. 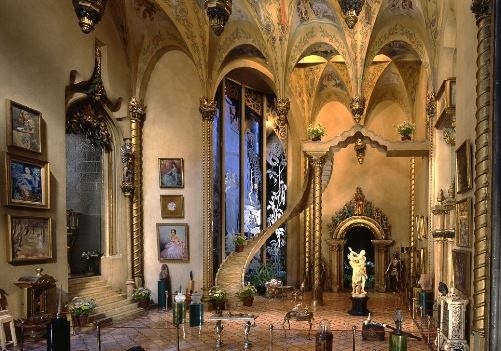 Today the “doll house” has been renamed the “Fairy Castle” and has its permanent home at the Museum of Science and Industry. 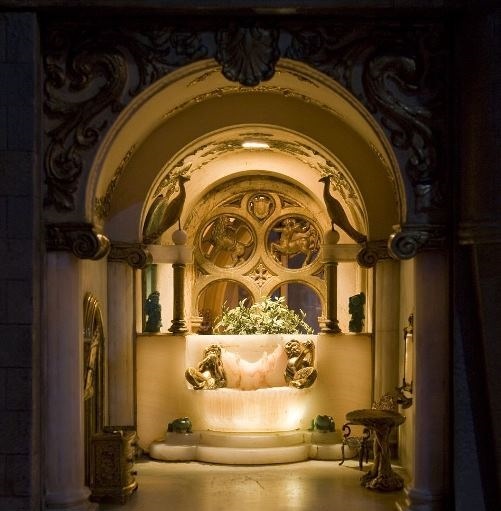 The Fairy Castle is displayed behind glass, and the light, temperature and humidity in its environment are carefully controlled to ensure that the artifacts will be preserved for generations to come. The Kitchen is filled with whimsical wall murals from various fairy tales. Over the door are the three Little Pigs, and to the right, Jack and Jill are tumbling down the hill. 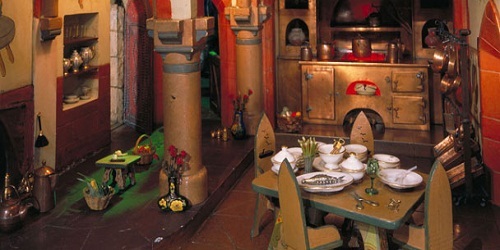 Humpty Dumpty can be seen through the archway and Little Bo Peep is above the stove. The copper stove is meant to be the stove in which the wicked witch locked Hansel and Gretel. Inside the oven is the pie that was baked with four and twenty blackbirds. The Royal Doulton dinner service on the table is an exact replica of the set made for Queen Mary’s doll house at Windsor Castle. 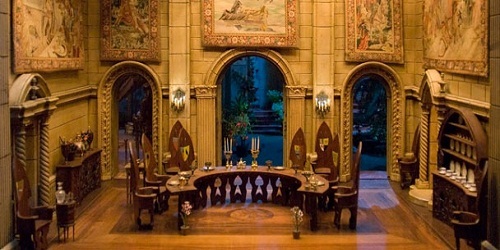 The Dining Room has a replica of King Arthur’s round table in the center. Beside the gold plates are tiny knives and forks, also of gold. The glasses are crystal—and most of them are more than a hundred years old! 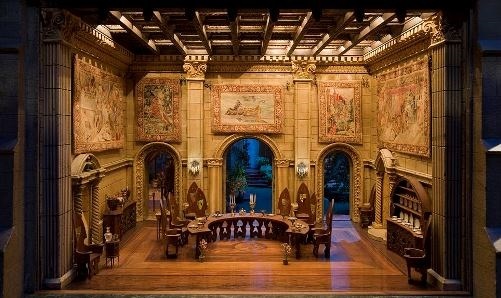 The five needlepoint “tapestries” in the room depict the Knights of the Round Table. The “petit point” works were commissioned for the castle from Madame Jorey, a master needle worker in Vienna. It is almost impossible to distinguish the stitches without the aid of a magnifying glass. 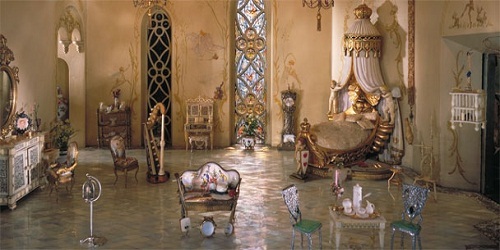 In Cinderella’s Drawing Room the floor is made of rose quartz and jade from China. The chandelier hanging in the center of the room is gold, hung with real diamonds, emeralds and pearls. To the left you can see a little chess table just waiting for you to come and play. 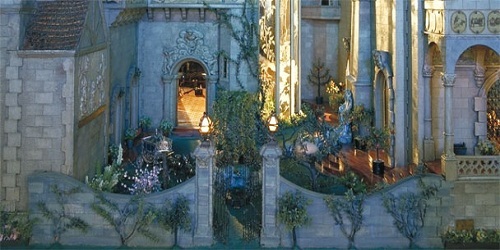 The mural on the wall is of Cinderella, and was painted by Los Angeles artist George Townsend Cole. Walt Disney himself contributed a full-length portrait of Mickey Mouse and Minnie Mouse dressed as the King and Queen of Hearts. The vases at each side of the door going into the great hall are made of carved amber more than 500 years old. They came from the collection of the Dowager Empress of China. 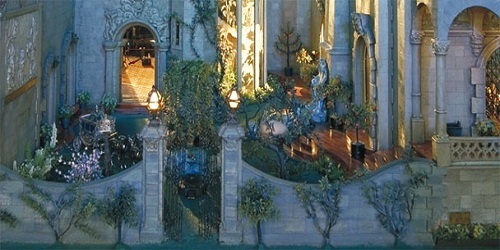 The Great Hall welcomes you to Fairyland. Below her are figures of Cinderella, the prince and the wicked stepmother. The ceiling of the Great Hall is painted in scenes from fairy tales. 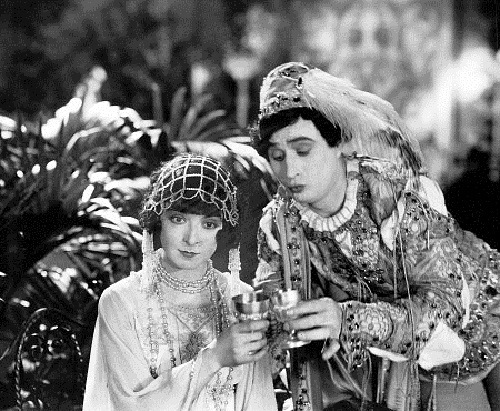 The knights in armor, at each side of the door, are silver and came from the collection of Rudolph Valentino. There are many things in the Great Hall which are very old. For example, a bust of a woman on a green pedestal. This bust is Roman and about 2,500 years old. Next to this, on that table, are three statues of the Goddess Isis, which are more than 4,000 years old. The 4th, a Syrian vase, is more than 1,000 years old. The Chapel. If you look to the right of the chapel’s organ, you can see a vigil light, with a very large diamond in the top. 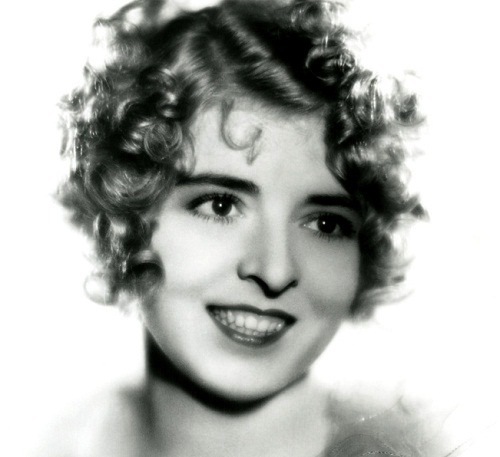 This was Colleen Moore’s mother’s engagement ring. When she died, she left it to Moore to put in the Fairy Castle. The silver throne is a copy of the famous English throne in Westminster Abbey. The statue on the pedestal to the right is a bust of Pope Pius IX, and on the bottom is the seal of the Vatican. On the prayer bench in front of the altar is a small Bible printed in 1840. It is the smallest bible in the world, and is printed from real type. The Library is done in a sea motif. Over the fireplace stands Captain Kidd with his treasure behind him. The door to the right shows Robinson Crusoe and his man Friday. Above the other door is Gulliver, pulling the Lilliputian ships through the gates of the city. 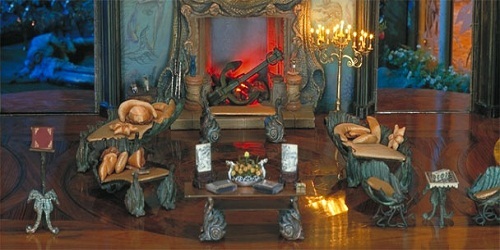 The furniture has a sea motif and is verdigris copper. Sea horses and sea snails hold the shell-like furniture. This furniture is made for fairy folk who like to read in different positions. That chair turned up in front is made for a little elf who likes to read with his feet in the air. The books in the library are all real. There are more than 100; many of them are handwritten by some very prominent authors. On the reading stand is a dictionary. 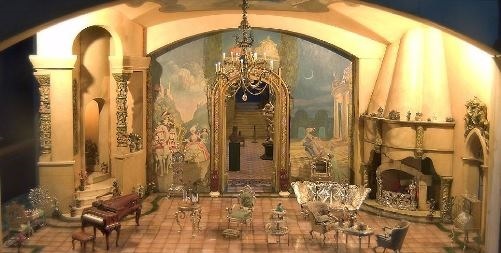 This was given to Colleen Moore by her father when she was only 5 years old, and it began her whole miniature collection. The Princess’ Bathroom. The crystal walls are etched to tell the story of Undine, a water spirit. 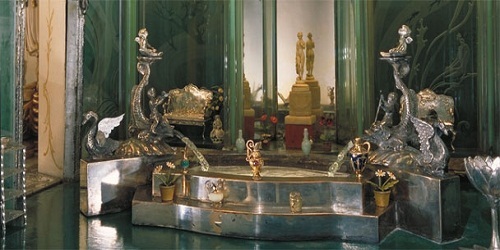 The tub is made of silver, and real water is able to flow from the dolphin’s mouths. The Princess’ Bedroom. The bed represents the bed that Sleeping Beauty slept in. The platinum chairs in the room are set with diamonds have seats of green cloisonne. 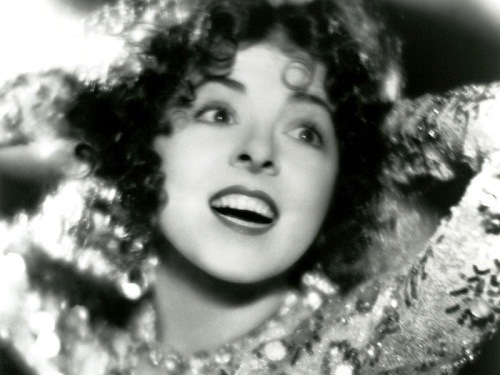 Their backs are made from a pair of emerald and diamond lapel clips that belonged to Colleen Moore. She decided that she would rather use the clips in the castle than wear them herself. The Prince’s Bathroom. 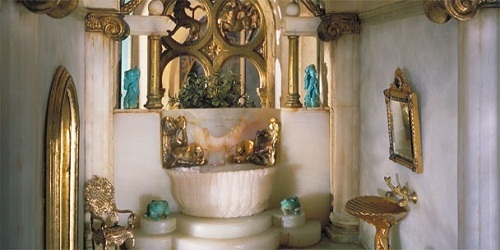 Upstairs is the bathroom of the prince, adorned in alabaster. The mirror over the shell-like wash basin is gold, set with a sapphire, surrounded by diamonds. The gold Japanese chest is approximately 500 years old. 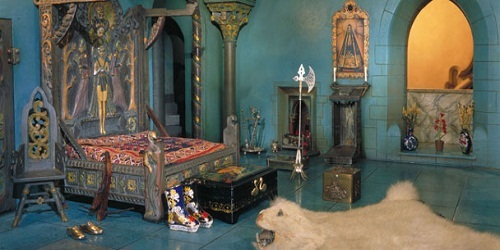 The Prince’s Bedroom. Next to the bath is the bedroom of the prince. 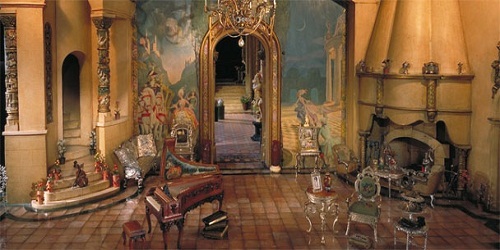 This room tells the story of the Russian Little Czar, Saltan. His story is carved in the furniture. A wicked white bear is a character in the Saltan’s story, and Moore had a taxidermist use an ermine skin and the teeth of a mouse to create the miniature white bear rug on the floor. The sword standing by the wardrobe is Excalibur, King Arthur’s sword. The Attic is filled with all the things that were left over from the different rooms that belonged to the ancestors of the prince and the princess. The Magic Garden. Notice the cradle that sits on the rocking tree. 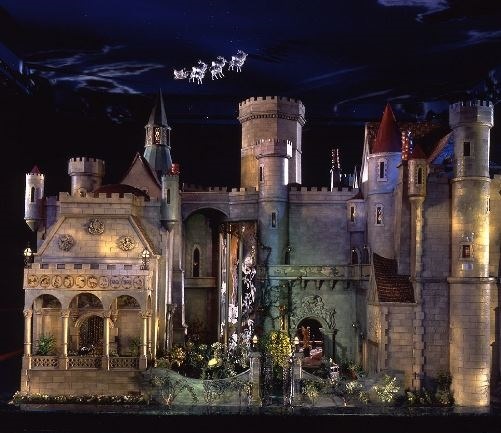 It is made of gold and pearls, was one of Moore’s favorite artifacts in the Magic Garden. 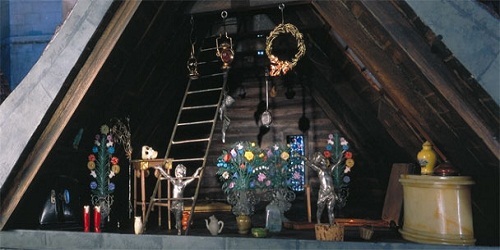 The cradle was made with jewelry from Moore’s grandmother, which she inherited from childhood. To the left on the wall of the garden, in bas-relief, is the story of the Wizard of Oz. Over the arched doorway, going into the Great Hall, is Aladdin with a genie coming out of his lamp. The silver coach outside is waiting to take Cinderella to the ball. 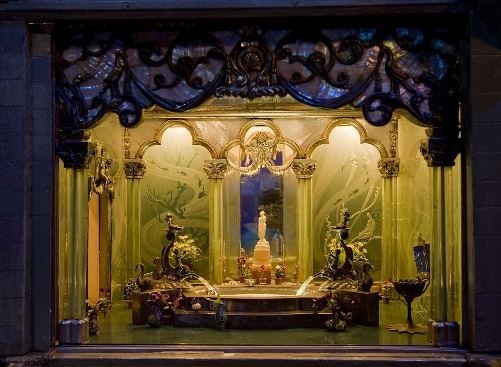 The miniature world was inspired by Moore’s lifetime obsession with doll houses. 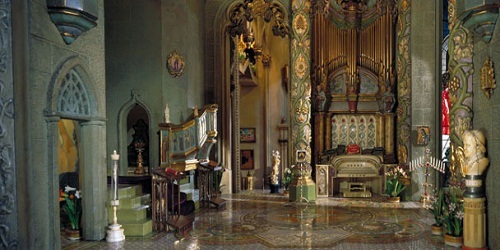 When it was completed in 1935, Moore sent Fairy Castle on a national tour to raise money for children left destitute by the Great Depression.